Depending on the grade level of your child, we have designed unique programs and experiences for both parents and applicants to explore the many aspects of Marist School. Campus Tour - Tours are reserved for current 6th and 8th grade students and their families. 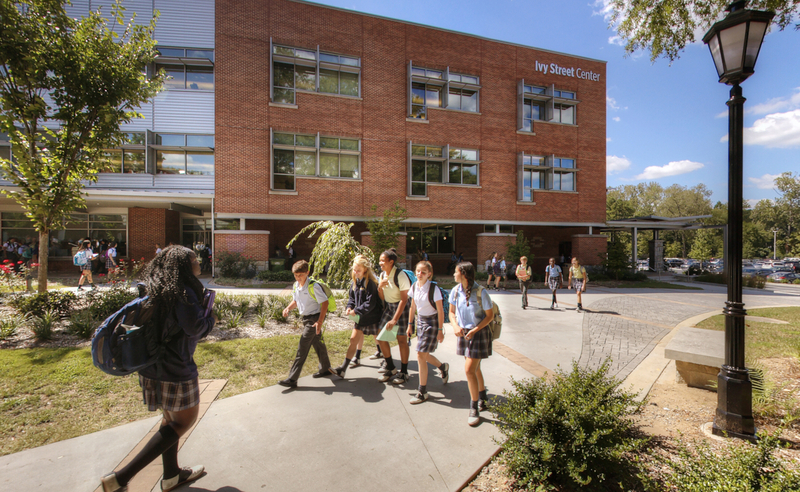 Campus Tour - Tours are reserved for current 6th and 8th grade students and their families. Please note that all 8th graders receive a campus tour during their Shadow Day. Parents of shadowing eighth graders are invited to stay for a one-hour tour after dropping off their child for the shadow day. Shadow Day - Come experience first-hand a typical day as a Marist Student. Learn more about this opportunity HERE. Marist School has two primary entry points for students. We enroll approximately 145 seventh graders as Marist's initial grade, and then at the beginning of high school, Marist enrolls an additional 60 freshmen. Admission to Marist after the ninth grade is dependent on space availability. Campus Tour - Familiarize yourself with our facilities while learning about our academic, spiritual, and extracurricular activities. Shadow Day - Should your child become an applicant, we will schedule a shadow day at the same time as the individual interview. This occurs in March 2019. Marist School's entry grades are 7 & 9. View Marist School's Policy on Eighth Grade Admissions HERE. Marist School begins in the seventh grade with approximately 145 students. For high school, Marist enrolls an additional 60 freshmen. While campus tours are reserved for students in their year of application, parents are invited to attend an Admissions Information Session and Open House. Begin by clicking on the photo below. You and your family are most welcome to visit us for any of our public events. The schedules for all our activities and athletic teams are listed on our website. Most are free and all are open to the public. Enjoy some soccer, diving, tennis or football, to name just a few of the many sporting opportunities. On the weekend, enjoy a jog on our cross country trail or a walk around the track. Marist School performs three drama productions. Tickets can be obtained in the Campus Store. Please start your day with Mass each weekday at 7:30 a.m. in the chapel.